I’m finally back! It has been months since I’ve written anything, but lots has happened since my trip to Mississippi in February. Summer is here and for people like me (youth pastors) that means short term mission trips. Many groups are heading down to the gulf coast to participate in Katrina recovery projects. It is amazing that it has been almost a year since Katrina and yet it seems that only a small dent has been put into all the recovery work that needs to happen. I’m still speechless over all the devastation, but encouraged by the spirit of people–people hurting from Katrina and people helping to put things right. 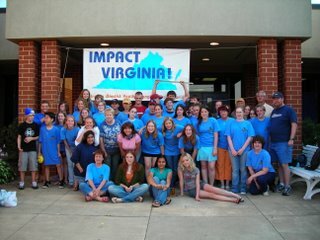 As for me this summer, our group participated in Impact Virginia! Impact is a youth missions opportunity that allows students and adults to participate in the rehabilitation of homes. We participated in the Spotsylvania area. Like past years, this was a great experience for our group. Lives were touched and God’s power and presence were felt. Read what the local newspaper had to say about Impact.